In July 2007, a smoking ban was introduced in all enclosed 'public' places - bars, restaurants, railway platforms and workplaces - in England. Three months later, Action on Smoking and Health (ASH) issued a fact sheet titled 'As the Smoke Clears: Myths and Reality of Smokefree England'. Before the ban, ASH consistently dismissed evidence from Ireland and the US that smoke-free legislation damages the hospitality trade. In this document, they asserted that it was all a lie. When the ASH fact sheet was released, the smoking ban had barely been in force for 100 days and pub chains and bingo operators had not yet announced their end-of-year accounts. Nor had the cold winter months arrived. There was, however, mounting anecdotal evidence of pubs and bingo halls suffering immediate hardship. Looking back on it with ten years of hindsight, much of 'Myths and Reality' is genuinely laughable. It uses selective data to paint a rosy picture of life after the smoking ban and led the public to believe that reports of economic damage were propagated by vested interests within what they called 'pro smoking organisations' and the 'hospitality organisations' (it was never explained why the hospitality industry would want to lie about the ban if it was not being damaged by it). ASH's document listed ten 'myths' about the smoking ban and then gave what ASH called the 'reality' to debunk them. With the tenth anniversary of the ban coming up on Saturday, it is worth comparing what they said at the time to what we now know happened. When interviewed in November 2007, the Chief Executive of Capital Pubs expressed confidence about trade 'despite the smoking ban'. At that time, the company's share price was £1.60 but once winter kicked in and the smokers disappeared en masse, the share price fell by 33%. It was sold to Greene King in 2011. Speaking of Greene King, stories such as 'Greene King sales rise allays smoking ban fears' and 'Greene King absorbs smoking ban' painted a rosy picture for the Suffolk brewery in the weeks following the ban. Greene King was one of the great recent success stories in the pub industry and it had more reason to be more optimistic than some of its rivals since 90% of its pubs were able to offer outdoor smoking areas. Like the other pub giants, the company expected a spate of pub closures elsewhere which would allow them to snap up some nice properties cheaply. Shareholders were less confident. After quadrupling in value between 2003 and February 2007, the company's share price peaked at over £10 before the smoking ban and then plummeted, dropping to a low of barely £3 in October 2008. It gradually rallied thereafter but has never reached its pre-ban peak and is still a third lower than it was in June 2007. It has been selling off pubs left, right and centre. By January, things were looking more desperate. With its share price in free-fall, Punch Taverns announced that the first six months of the ban had seen sales slip for the first time in years. In the six months since ASH had cited the 2.3% rise in Punch's share price, the company's stock had nearly halved, from £11.00 to £6.00. A company spokesman finally had to admit the obvious: 'The smoking ban has impacted trading,' he said. Shares in Punch are currently available for £1.79. Finally, there is Mitchells & Butler, owners of the Harvester chain. Once again, its share price tells the story, peaking in June 2007 before losing 75 per cent of its value in the first year of the ban. Today, it is still 75 per cent down on its pre-ban value. And what of the pub chains ASH didn't mention? The country's second-biggest pub company, Enterprise Inns, sold all its pubs in Scotland within months of the smoking ban coming into effect north of the border. In November 2007, it announced its first drop in profits for five years and its CEO warned that the smoking ban would lead to further pub closures. You can probably guess the rest. Enterprise's share price peaked in the weeks before the smoking ban came into effect in England and halved in value over the next twelve months (from £7.80 to £3.90). Its shares bottomed out at 36p in 2009 and can be bought for £1.30 today. Regent Inns issued a profit warning in December 2007 and announced that trading had deteriorated as winter set in. Its shares immediately fell by 34 per cent and by the end of 2009 was in administration. This increase in pub closures is unprecedented in recent British history and although the smoking ban was not the sole cause, the evidence that it has been severely damaged by the smoke-free legislation is now indisputable. What ASH said then: 'In the lead up to the smoking ban, pro smoking groups argued that the smokefree legislation was going to be particularly detrimental for both the profitability and long term outcomes of Bingo, with smokers more likely to stay home and use online gaming sites. Of all the hostages to fortunes ASH left in their 'fact sheet', the claim that bingo would thrive under the smokefree legislation was the most vulnerable to reality. What ASH did not mention in their rebuttal of this 'myth' is that Rank were 'encouraged' because bingo revenues in England had fallen by a mere 4.4% since the ban despite revenues having risen 2.3% in the six months before it. It says much about the devastating effect of the smoking ban in Scotland that Rank declared themselves pleased with a 4.4% fall in revenue in England; they had seen a 15% fall in revenue in Scotland after the ban was introduced there in February 2016. Still, it was only August and things were about to get a good deal worse. In October, Rank issued a profit warning and announced that its Mecca Bingo and Grosvenor Casinos businesses had 'experienced a significant deterioration in revenue in recent weeks'. This was just the beginning. 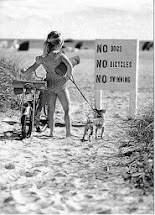 In England and Wales, bingo revenues fell by 20% after the ban came into effect. Initial predictions that the smoking ban would cost the company £1 million were shown to be ridiculously optimistic. By spring 2008, Rank were losing £1m in revenue every fortnight from the gaming machines alone. As for the 8.75% upturn in Rank's share price which ASH used as evidence that the smoking ban was not 'bad for bingo', it would have brought a hollow laugh from the company's accountants. It was a tiny blip in an unremitting downward cycle for the stock. Since trading at a high of £4.40 in the weeks before the Scottish smoking ban began, nearly 70% was wiped off the company's share price in the months that followed. In February 2006 the stock was trading at well over £3.00. Two years later their shares were valued at 50p. By the end of the year, Gala's bingo revenues had fallen by 11% but the company promised not to close any bingo halls. Alas, there was no sign of a revival over Christmas and the New Year and the first English closures were announced a few weeks later. What ASH said then: 'Critics argued that a total ban on smoking in public places would not be possible to police and there would be large scale non- compliance. This is a bit of a straw man. The claim that 'there will be large scale non-compliance' was never made by 'pro-smoking organisations'. In fact, FOREST always maintained that widespread civil disobedience was unlikely. By fining landlords, rather than smokers, the law was cleverly designed to get publicans to police the ban themselves. For the most part, it worked. The ASH fact-sheet only references an article from the Daily Telegraph which had the headline '100s of pubs to flout smoking ban' but which did not quote anyone from a 'pro smoking organisation' promising 'large scale non-compliance'. What ASH said then: 'Pro smoking organisations and landlords reasoned that the smoking ban would result in heavy handed enforcement, covert filming and armies of undercover enforcement officers. Simon Clark, a FOREST spokesperson, argued that it will be like a 'sledgehammer cracking a nut' and the British Beer and Pub Association believed that enforcement would be too heavy handed. There is an element of misrepresentation in ASH's comments here. Their opponents' argument about enforcement was more about disproportionate resources and unnecessary powers than about fear of thuggery and repression. Groups like FOREST acknowledged from the outset that the smoking ban would take little enforcing and that it was therefore excessive to devote £30 million and 1,200 officials to the task of policing it. Besides, although 1,200 people may not quite constitute an 'army', it is a sizeable regiment and it is a lot of people to employ for the purpose of giving out the handful of tickets ASH describe above. The analogy of the sledgehammer and the nut does not seem entirely out of place. As these quotes illustrate, it was not the 'pro smoking organisations' who were warning of 'heavy-handed' enforcement and 'covert filming'. It was the very people charged with policing the ban. They were given £30 million and 1,200 officials who were given permission to secretly film in pubs and elsewhere. One of the people who 'tried to make a stand' was Nick Hogan who was ordered to pay £10,000 for breaching the law and was ultimately imprisoned. Another was Tony Blows who was ordered to pay £12,000. Hamish Howett had his pub licence revoked. Hundreds of taxi drivers have been fined for smoking in their own vehicles. One cabbie was fined £200 for merely failing to display a No Smoking sign. It all sounds a bit heavy-handed and disproportionate to me. What ASH said then: 'Claims and protests that the smoking ban would result in mass closures of shisha bars and working men's clubs, threatening the livelihood of the owners were unfounded. Working men's clubs feared that the smoking ban would see one in five of its clubs closing down following the smoking ban whilst shisha bars argued that they would be unable to operate if smoking was banned in enclosed places. If it was not clear in October 2007, it is certainly clear now that there is nothing mythical about the working men's clubs that have shut their doors since the smoking ban came into force. Within months of the ban coming into force, working men's clubs were closing at three times the rate they were before the ban and their management have regularly identified the smoking ban as a major factor in the collapse of their businesses. Although I have been unable to get any reliable figures, the original prediction of one in five WMCs closing does not seem far-fetched. After all, one in five pubs have closed. There is less evidence of shisha bars closing but this is likely due to widespread noncompliance. A great many shisha bars have been fined for breaching the smoking ban (eg. here and here). Before the ban came into force, ASH and the other anti-smoking groups insisted that the legislation was designed to protect the health of nonsmokers, but once it was in place they felt able to admit to its true purpose: coercing smokers into quitting. Perhaps surprisingly, the ban was not accompanied by a fall in the smoking rate. On the contrary, the long-term decline in smoking prevalence came to an end in 2007 and did not resume until 2013 when e-cigarettes became popular. What ASH said then: 'Pro smoking groups continue to dispute credible medical evidence regarding the dangers of secondhand smoke and the health consequences of smoking. Reality: Numerous international reports from bodies such as the WHO, IARC and the UK's Scientific Committee on Tobacco and Health found that exposure to secondhand smoke was responsible for an increase in heart disease, lung cancer and reduced lung function. Recently released research from Scotland shows that admissions to hospital for heart attacks have declined by 17 per cent since the introduction of the smoking ban in public places. 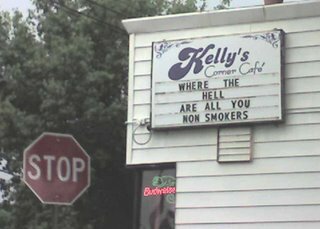 I'm not sure if 'pro smoking groups' disputed the health consequences of smoking, but they were right to dispute the claims made about passive smoking. I have discussed secondhand smoke epidemiology many times on this blog and in my book Velvet Glove, Iron Fist so I won't go into it again here. I have also discussed the junk study from Scotland that ASH refer to (see here and here, for example). Suffice to say, I don't consider it to be 'credible medical evidence'. Regarding the claim about shisha being the equivalent to 300 cigarettes, it is also junk science that has been debunked by this expert. The rest of ASH's rebuttal merely explains that people breathed less secondhand smoke after the ban than they did before, which is obvious. The question is whether they were any healthier. Despite a slew of dodgy claims, such as the recent nonsense in the Guardian, I have seen nothing to indicate any measurable health benefit. What ASH said then: 'Preceding the smoking ban, claims were made that the legislation was going to cause people to stay at home and smoke instead of going out to a pub or club and this would result in a greater number of house fires. This is another straw man argument. I can find no record of any opponent of the ban making such a claim and nor, it seems, could ASH since they resort to citing a press release from the insurance company Direct Line as the sole reference. However, it almost goes without saying that, contrary to ASH's assertion, there has been a big rise in people drinking at home since the ban came into effect, thereby leading to a fall in pub sales (see above). What ASH said then: 'Pro smoking groups argued that we would see an increasing number of people buying alcohol from supermarkets and off licences and drinking and smoking at home instead of pubs, which would result in exposing children to greater levels of secondhand smoke. There can't be many people in Britain today who deny that the last decade has seen an 'increasing number of people buying alcohol from supermarkets and off licences and drinking and smoking at home instead of pubs'. The shift from the on-trade to the off-trade has been well documented. Whether this has led to more secondhand smoke 'exposure' in the home depends on the household. 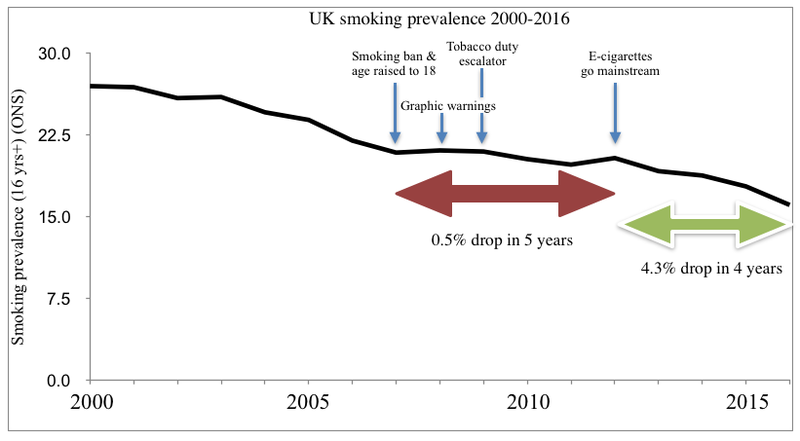 There is evidence that the smoking ban has denormalised indoor smoking in some homes, so this could be the one 'myth' about which ASH were largely correct. Myth: The public do not want a smoking ban or any further tobacco control measures. What ASH said then: 'Groups such as freedom2choose argue that the public are not only against the smokefree legislation but they also do not want further tobacco control measures. There are two different issues at play here. The first is whether the public supported the smoking ban. The second is whether the public supports 'further measures'. In their rebuttal, ASH cite the results of a survey they commissioned which showed that the majority of people supported the banning of cigarette machines and the use of graphic warnings on cigarette packs. But these issues had nothing to do with the smoking ban and were not raised by 'the hospitality industry and pro smoking groups' at the time. This diversionary tactic takes the reader's mind off the real issue which is that the majority of the public did not want an outright ban on smoking in pubs. And they still don't. Almost every survey conducted in England has shown that a clear majority of people would - if given the choice - prefer to see designated smoking sections rather than an outright ban (eg. the ComRes lifestyle survey). I suspect that ASH only included this section because they wanted to get the ball rolling on their next campaigns. When ASH published 'Myths and Reality' there was already abundant evidence that the 'myths' were true and ASH's 'reality' was a fantasy. Whether measured in terms of revenue, profit, share price or closures, the hospitality, pub and bingo industries had suffered as a direct result of the implementation of England's smoking ban and continued to do so for years. Much of this damage was evident as early as September 2007. For those with eyes to see, it was evident on July 1st. Documents like 'Myths and Reality' were aimed at persuading policy-makers and the media that the smoking ban had been a success on every level. After securing the legislation in 2006, ASH's Deborah Arnott famously described her campaign as a 'confidence trick', adding that 'the appearance of confidence both creates confidence and demoralises the opposition'. The purpose of 'Myths and Reality' was to display further confidence while implying that vested interests were spreading false stories of economic damage caused by the ban. This has long been the tactic of anti-smoking groups in the United States where journalists and news editors think twice before covering any story that portrays anti-smoking policies in a bad light. The myth of a prosperous and happy smoke-free England obscured the reality of closures, bankruptcies and unemployment. It was an effective strategy. Reports of pub, club and bingo hall closures were largely confined to the regional press and trade journals in the first months of the ban. The sevenfold increase in pub closures barely created a ripple in the mainstream press in the early days of the ban, although by 2009 the rate of closures could no longer be ignored. ASH and its coalition of 'public health' groups lied throughout the campaign for the smoking ban and they lied immediately afterwards. I expect them to lie in the next few days as this draconian legislation reaches it tenth birthday. It was indeed a confidence trick and England was conned. A motion will will be discussed at the British Medical Association’s annual conference in Bournemouth this week expressing dismay at the rate of tooth decay pointing to the more than 34,000 children aged 9 and under who have had tooth extractions in the last two years. As I have explained before, tooth decay among children (and adults) is at an all-time low. The number of 12-year-olds who exhibited clear signs of tooth decay fell from 81 per cent in 1983 to 28 per cent in 2013. One in three kids of this age had a cavity in 1983 but by 2013 this had fallen to one in nine. The reason we have children having teeth extracted in hospital is because the government banned dentists from using general anaesthetic. 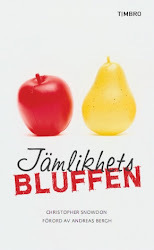 Putting stupid warnings on sweets is not going to stop kids eating them. All they need to do to prevent tooth decay - the one and only thing that is guaranteed to work regardless of their diet - is to brush their teeth. In this year’s budget, chancellor Philip Hammond announced a sugar tax on all soft drinks, which is due to come into force from next year. Campaigners such as Action on Sugar want the levy extended to cover sweets and confectionary [sic] as well. What does this spanner think sweets should be made from if not sugar? Disgusting artificial sweeteners, presumably. Look, I understand that some people are stupid enough to think that there shouldn't be sugar in pasta sauces or tomato ketchup, but nobody buys confectionery thinking that its a health food. It's a treat and we don't need this raving lunatic MacGregor degrading its taste. Doctors on the BMA’s Yorkshire Regional Council will also call for a tax on bags of sweets sold greater than 100g per unit bag or bar to combat childhood obesity rates and type 2 diabetes. They also believe the advertising of high sugar drinks should be prohibited on TV before a watershed to avoid influencing children. Is it a full moon tonight or something? Medics in Yorkshire will also call for the minimum pricing for confectionery products and sweets. Hardened though I am to moronic 'public health' proposals, even I am left speechless at this idea. Will nobody rid us of these meddlesome quacks? Action on Smoking and Health's Deborah Arnott has always believed in the power of repetition (see photo), but has become particularly robotic in the last 18 months. All we ever here from ASH at the moment is the 'urgent need' for a new tobacco control strategy. They have been getting increasingly vocal about this since December 2015 when the previous plan expired. In January, they got a bunch of doctors and 'public health professionals' to write a letter to the BMJ pressing for a new plan and Arnott said 'we need the government to implement the promised new tobacco control strategy without further delay'. The following month, ASH got their puppet all-party group to ask the government to publish a new tobacco control plan ASAP. I can't remember seeing a quote from ASH in the last 18 months that hasn't included a call for a new strategy to be published 'urgently' or 'without delay'. The strange thing is that ASH don't have many policies they want the government to introduce. Insofar as they have an agenda, it involves more funding for themselves and their fellow extremists. To that end, they are keen on the unworkable tobacco levy, but that is about the limit of their ambitions. You'd think they would be lobbying for a raft of measures to be included in the new plan, rather than simply demanding that a new plan - any plan - be published. Why are they so concerned about the delay? The answer is obvious when you consider what their government grants are supposedly earmarked for. Ever since people started noticing the scam of ASH being given unrestricted grants to lobby the government, the Department of Health has been careful to give them restricted grants for specific purposes. In recent years, their grants have been for 'supporting the Tobacco Control Plan for England'. This is very vague and, as far as I can see, still amounts to taxpayer-funded campaigning (see this post for details), but it makes it look as if ASH are contractors of some sort. They further claim that their role in 'supporting' the plan involves providing 'factual information' (sic! ), 'resources' and, er, 'support'. As fig-leafs go, it's pretty feeble, but it seems to be enough to fool the authorities into thinking that the money is not being spent on advocacy. But ASH are now in a quandary. There hasn't been a Tobacco Control Plan for England for a year and a half. If there's no plan, how can ASH support it? And if there's nothing to support, why is the government giving them so much of our money? What have they been doing with the £250,000 or so that they have been given by the state in the last year and a half? It is only a matter of time before someone asks these questions. That, I suspect, is why ASH are getting so hot and bothered at the moment. The phrase ‘virtue signalling’ can be overused, but how else can one describe the ludicrous divestment movement which seeks to bring down industries by trading their shares. The Guardian believes that if you get rid of your shares in fossil fuel companies you will somehow help prevent climate change. Aviva, the insurance company, recently announced that it would be selling off its tobacco stock in order to ‘limit the damage tobacco can cause to health’. Various universities and local councils have loudly proclaimed their intention to abandon their investments in ‘sindustries’ such as alcohol, coal and weapons. It is the emptiest of empty gestures and, for those whose pensions rely on sound investments, an expensive one. Like it or not, tobacco stocks have outperformed almost every other form of investment since the turn of the millennium. Since 2000, the share price of Imperial Brands (formerly Imperial Tobacco) has risen tenfold while shares in British American Tobacco have risen twenty-fold. If Aviva believes that the tobacco market has peaked then they should sell, but that is not the view of most investors and it does not seem to be Aviva’s motive. By publicising its divestment, the company seems to be reaching for the high moral ground, perhaps believing that future dividends are worth sacrificing for the sake of being viewed as an ethical investor. Let us hope that there is nothing more to it than that because the company would be deeply deluded if it thought that selling its shares in cigarette companies will have the slightest effect on cigarette consumption. The most that can be achieved by divestment is a dip in the share price, but unless huge numbers of shares are dumped simultaneously, this will be barely perceptible on the stock market. And even if large-scale divestment made the share price wobble, it would not affect the fundamentals of the business and could not possibly have any effect on consumption of the product. You have to wonder whether campaigners for divestment really understand how the stock market operates. From their rhetoric, you would think that Exxon Mobil and Philip Morris were start-up companies looking to raise money by floating on the stock exchange and that they can be starved of cash if people refuse to buy their shares. This is obviously not how it works. Divesting from tobacco stock will have a negligible impact on the share price and will have absolutely no impact on either cigarette sales or company profits. There is no mechanism by which selling shares could deter a single person from smoking. I am not in the business of forecasting how the stock market will perform in the future but it is a simple truth that any fund manager who has neglected tobacco shares in the last fifty years has missed a trick. They have consistently outperformed the rest of the market. If anyone has been persuaded to sell their tobacco stock in the hope of lowering the smoking rate, it has been a futile act of economic self-harm. 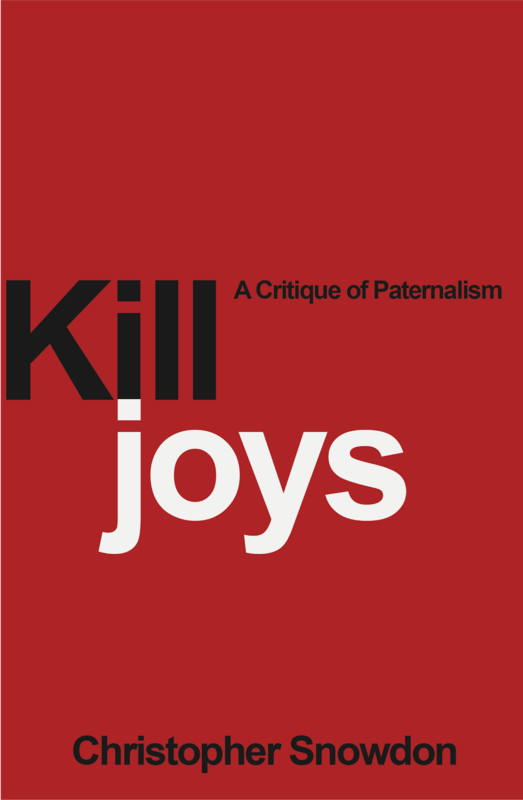 People who disapprove of a company’s products are free to invest in something else; they may even feel morally obliged to invest in something else. You can sell your shares and feel virtuous, but don’t pretend that you are changing anything. The smoking ban has always sat on a throne of lies. It was promoted on the basis of junk science and has been retrospectively justified on the basis of blatant quackery. The tenth anniversary of England's smoking ban is coming up on Saturday and so we must brace ourselves for more lies as we 'celebrate' its anniversary. That's right, folks. It's another heart miracle, but since it's been devised by the clots at Public Health England, it's particularly amateurish. Deaths from heart disease and strokes caused by smoking have fallen dramatically since lighting up in pubs, restaurants and other enclosed public places in England was banned 10 years ago. New figures have shown that the number of smokers aged 35 and over dying from heart attacks and other cardiac conditions has dropped by over 20% since 2007 while fatalities from a stroke are almost 14% down. When I first read this, it wasn't clear what the statistics pertained to. The figures appear to be about the number of smokers dying of heart disease, but it would be odd if smokers were getting a health benefit from a reduction in secondhand smoke exposure. Figures collected by PHE’s Local Tobacco Control Profiles network show that while there were 32,548 deaths from heart disease attributable to smoking in 2007-09, there were 25,777 between 2013 and 2015 – a fall of 20.8%. Similarly, a total of 9,743 smokers died from a stroke in 2007-09, but fewer – 8,334 – between 2013 and 2015, a drop of 14.5%. This would be a half-arsed way of claiming that correlation equals causation at the best of times, but since the ban started in 2007, it's unclear why they are comparing 2007-09 to 2013-15. Surely you should compare the pre-ban era to the post-ban era? As I showed in a recent post, smokers were quitting in large numbers before 2007 but that came to an end after the smoking ban was introduced. In 2003, the smoking rate was 26%. By 2007, it had fallen to 20.9%. But five years later - after what Selbie calls 'undoubtedly the single most important public health reform in generations' - it was still at 20.4%. Only after vaping came on the scene did smoking prevalence start falling again. 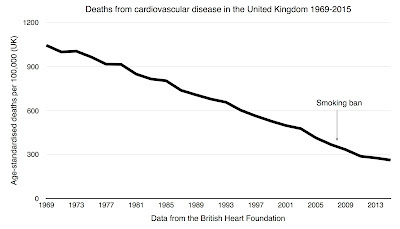 So what actually happened with heart disease before and after the smoking ban? 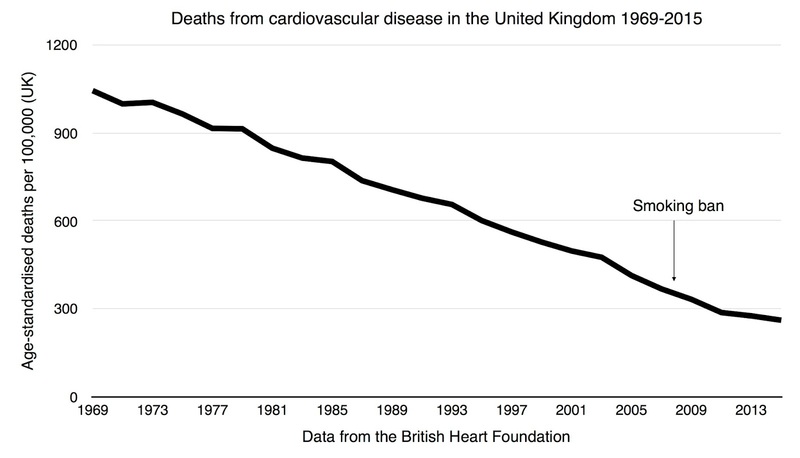 Using data from the British Heart Foundation, we can see a steep and steady decline in cardiovascular disease mortality going back decades. Did the decline accelerate after 2007? No, not at all - although it did slow down a few years later. Great success! 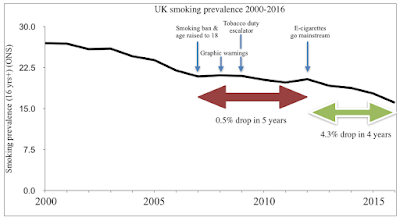 The statistics, which Public Health England (PHE) has shared with the Guardian, come as medical, public health and anti-tobacco groups prepare to mark the 10th anniversary next Friday of smoking being prohibited in indoor public places by Tony Blair’s Labour government on 1 July 2007. The only thing that has been extraordinary is how many of these places have closed down since this 'important health reform' was inflicted on us. Twenty per cent of pubs have closed since 2007. Fifty per cent of nightclubs have closed. Bingo halls, snooker clubs and working men's clubs have all taken one hell of a beating. There is nothing to celebrate in this act of cultural vandalism. We should be having a wake. 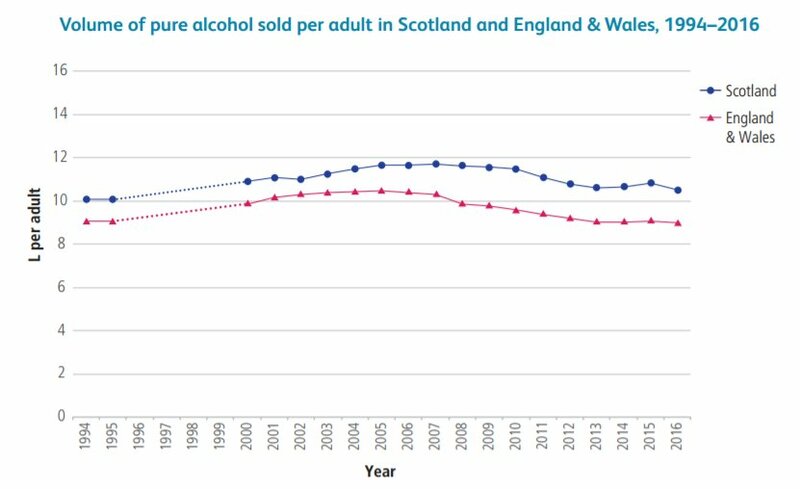 NHS Scotland have published updated sales figures for alcohol in Scotland. These suggest that a decline in alcohol consumption since the mid-2000s has started to reverse. Between 2005 and 2013, consumption per head of population in Scotland fell by 9.4%. Since then, however, it has risen by just under 2%. We don’t know yet if this small increase is the start of a longer upswing, but it suggests that industry efforts to stem the reduction in drinking may be starting to have an effect. ...if Governments wish to make the recent downturn sustainable, then they will need to fend off growing calls from industry for further tax cuts. Alcohol sales in Scotland increased last year, according to the latest figures. An NHS report said the equivalent of 41 bottles of vodka or 114 bottles of wine per adult were sold in 2014. The Scottish government said the figures reinforced the need for minimum unit pricing. Adults in Scotland have increased their consumption of alcohol for the second year in a row, according to a report. NHS Health Scotland said the trend was mainly down to more alcohol being bought in supermarkets and off-licences - particularly beer and wine. Sales in 2015 were 20% higher in Scotland than they were in England and Wales, with each adult consuming the equivalent of 477 pints of beer. Alcohol Focus Scotland said the country had become a "nation of home drinkers". The Scottish government said the report supported the case for minimum pricing. If a rise of 0.1 litres is enough to garner headlines, you'd think that a fall of 0.3 litres would be newsworthy, but you'd be wrong. The drop in consumption was barely mentioned by the journalists who covered the latest figures. The Scotsman didn't mention it at all in its story which was headlined 'Scots buying enough alcohol to push population over drinking guidelines'. Nor did STV, which used the headline 'Alcohol death rates six times higher in poorest areas'. 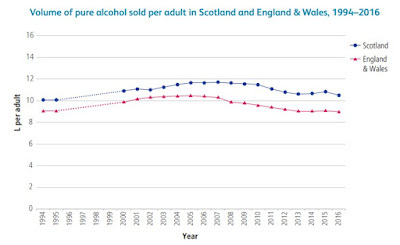 The media were taking their cue from NHS Scotland who put out a press release titled 'Scotland's alcohol problems persists' saying that per capita consumption was 10.5 litres in 2016 and comparing this to England (where consumption is always lower). The press release mainly focused on the number of people who die from excessive drinking. Sales of alcohol per adult per week were 17% greater in Scotland than in England and Wales - although the rate, which had increased between 2013 and 2015, returned to a similar level as in 2013. An average of 22 people a week died from alcohol-related causes in Scotland in 2015, figures show. The figure is 54% higher than in England and Wales. Public Health Minister Aileen Campbell, said: "This report shows that, whilst some progress has been made in tackling alcohol misuse, we need to do more. "Over the last few years, more than half of alcohol sold in supermarkets and off-licences was sold at less than 50p per unit and enough alcohol was sold in the off-trade alone to exceed the weekly drinking guideline by a considerable amount. "That is why we need minimum unit pricing, which will largely impact on the off-trade and will increase the price of the cheap, high-strength alcohol." Alcohol Focus Scotland chief executive Alison Douglas, said: "Alcohol is so cheap and widely available that it's easy to forget how it can damage our health. "We need to introduce this long-delayed policy as soon as possible to improve Scotland's health, cut crime and save lives." Unlike England, Scotland officially endorses the Whole Population Approach, a daft but convenient fantasy in which heavy drinkers magically reduce their consumption of alcohol if the rest of society drinks less. This theory has never been supported by evidence but it gives 'public health professionals' free rein to lobby for policies that hassle ordinary drinkers instead of doing the hard work of helping alcoholics. Given Scotland's obsession with per capita alcohol consumption, it's not surprising that campaigners were eager to present a tiny upwards blip as proof that the fall in consumption had 'stalled' and, therefore, required yet more government intervention. Nor is it surprising that they have kept quiet about the latest figures. But whatever happens to the trend in the future, it is clear that the rate of alcohol consumption is irrelevant to the neo-temperance lobby. If it rises, it shows the need for minimum pricing. If it falls, it shows the need for minimum pricing. If it rises, it's a news story. If it falls, they find another angle. There is no way for drinkers to win. By a bizarre coincidence, there was a big neo-temperance conference in the same hotel the following day featuring John Holmes, Robin Room and many other familiar names. Our paths did not cross. There was a story in The Telegraph last week claiming that eating chips (french fries, if you're American) 'doubles your chances of death'. The headline was obviously silly, but I'm not sure the study should be taken too seriously either. I wrote about it for the Spectator. Have a read. New smoking prevalence data were published today and it was egg on face time again for the anti-vaping alarmists. Britain's smoking rate fell by 1.7 percentage points between 2015 and 2016 and has fallen by 4.3 percentage points since vaping went mainstream in 2012. All that talk about the 'gateway effect' is looking decidedly stupid now. Taxi for Capewell and McKee please! As this graph shows, the smoking rate was flatlining between 2007 and 2012 when ASH's neo-prohibitionist efforts were in full effect. Since then, ASH have been mainly lobbying for plain packaging, a policy that came into force this year and isn't covered by the latest ONS data. The only anti-smoking law of any note since 2012 was the display ban and that wasn't introduced until 2015. Whereas government coercion failed to reduce the smoking rate, vaping in a free market worked. To put it another way, the smoking rate fell at an average rate of 0.1% in the five years after the smoking ban. Since 2012, it has fallen at more than 1.0% a year. Taxi for Arnott! To put it still another way, between 2013 and 2016 the UK had vaping but did not have plain packaging and the smoking rate fell by 3.1 percentage points. In Australia, which had plain packaging but did not have vaping, the smoking rate fell by 0.6 percentage points. In fact, as the Australian government recently admitted, 'the daily smoking rate did not significantly decline' at all between 2013 and 2016. Taxi for Chapman! Meanwhile in the good ol' US of A, new smoking figures for school students were also been released today. Was there any sign of a gateway effect in the home of anti-vaping hysteria? Not at all. Cigarette smoking prevalence is down to just 8 per cent among high school students. In 2011, the rate was 16 per cent. Enough time has passed for us to close the book on the gateway hypothesis. If 'public health' was an honest enterprise, the people responsible would resign, or at least apologise. Let's not forget that they wanted to ban e-cigarettes - and probably still do. There will be no resignations, of course. The denial and quack science will continue, but it is getting ever more more difficult to maintain this absurd scare story. As you can see, it made no difference at all. See you tomorrow. In our study in a large UK mental health organisation, there was a significant reduction in the number of physical assaults after the introduction of the comprehensive smoke-free policy, when controlling for time, seasonality, and confounders of violence. After adjustment for all significant confounders, the results suggest there was a 39% reduction in the number of violent assaults per month overall in the period after the introduction of the policy compared with the period before the policy was introduced. Jeez. Stop wasting our time with this garbage. Benedict Spence has written a nice little article at Spectator Health about the inevitable demands for graphic warnings and plain packaging to be rolled out to alcohol. 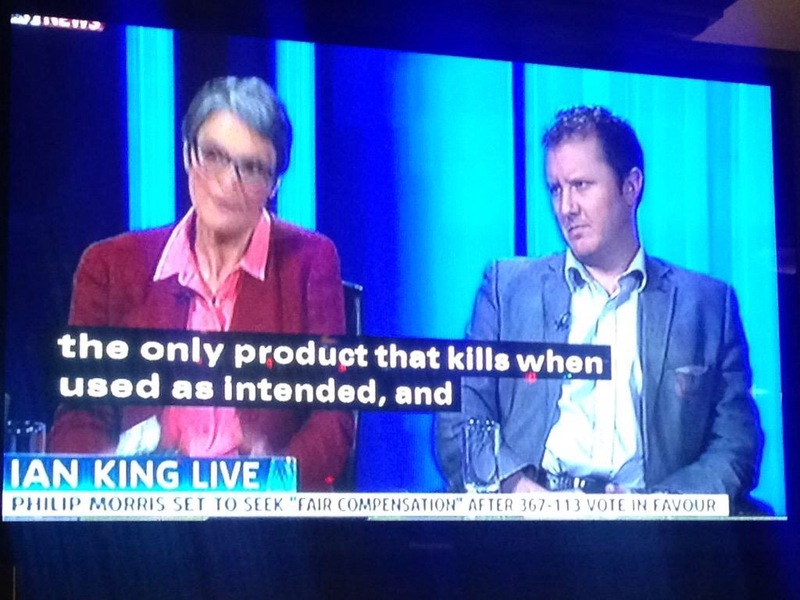 Dr Judith Mackay, an advisor to the World Health Organisation who took on the tobacco lobby [ie. people who enjoy smoking - CJS] in Asia, said there were lessons to be learned from the fight against smoking in efforts to "de-normalise" excessive alcohol or calorie consumption. 'Lessons to be learned'? Check. 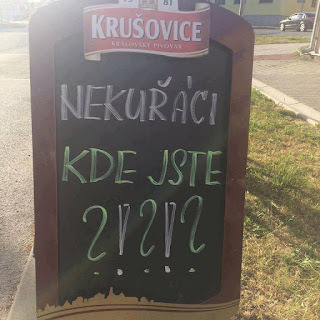 Food as well as alcohol? Check. This could easily be a parody article from a group like FOREST five years ago. Dr Mackay said: "About 100 out of nearly 200 signed up to the convention on tobacco have these graphic health warnings on the cigarette packs and many are getting plain packaging. Would the same happen to food labels and bottles of alcohol? It's an interesting question. The problem is that everybody has to have food. It's much more nuanced and complicated, and would be fought tooth and nail by the food industry." Yeah, because it's only the food industry that would be opposed to covering food packaging with diseased organs, isn't it Judith? It's not as if millions of ordinary people would be adversely affected by your morbid crusade to make people think about death every day of their life? "It's a matter of degree - if you have one hamburger a year, it's not really going to harm you. On the other hand, if your diet is constantly hamburgers it would." If you have one cigarette a year, it's not really going to harm you either, but I'm probably breaking some law or other by even mentioning that. And, as always, Judith, the eternal question remains: what the hell has any of this got to do with you? 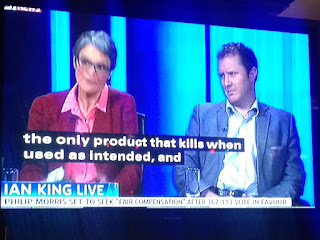 "I think for alcohol it would be easier because we know the harm - it's not entirely inappropriate to put warnings on label not to drink in pregnancy for example, or not to give children alcohol - so there are some messages that countries could start with that would probably be accepted across the board, before food, but it would be a challenge for both of them." This woman is utterly lacking in ethics or principles. She is an opportunist prohibitionist. She has no problem with the 'potential template' of denormalising people who drink alcohol and eat hamburgers. On the contrary, it excites her. The only thing holding her back is the 'challenge' of doing it - the opposition from industry, the politics, the timing. She'd go for graphic warnings on alcohol 'before food', but it's quite clear that if she succeeded with alcohol, food would be next. The only thing keeping these people's whirlwind of destruction in check is political opposition, lobbying and power - but they are increasingly winning those battles. They have no conscience. No sense of right or wrong. No conception of costs and benefits. No interest in freedom or personal responsibility. If they can ban it, they will. If they can put disgusting images on any product that carries the slightest risk, they will. ...thirty years ago there were people who warned that the anti-smoking campaign would set a template for food faddists, teetotallers and other puritans and cranks. This was always strongly denied, but it is now glaringly obvious that they were right. The government’s latest estimates suggest that 80% of harmful pollution at the roadside in the UK is coming from cars, vans and buses. This pollution is hugely damaging for our health – tiny particles and poisonous gases are able to travel deep into our lungs and recent studies have shown they can get into our bloodstream. For children whose lungs are still developing, these emissions are even more dangerous. They can stunt the growth of their lungs and leave them with permanent lung damage. On average, we spend about 1.5 hours a day in our cars. In recent years, we have taken major steps to protect children from breathing in secondhand smoke in cars. Alongside the British Lung Foundation, parents across the UK demanded the government bring in new legislation to ban smoking in cars with children. In a 2014 survey nearly 80% of adults and 64% of smokers supported the ban and MPs overwhelmingly voted for it. So why are we still happy for our children to breathe in toxic emissions in the back of our cars? Ooh, ooh! I know that one! It's because the ban on smoking in cars had nothing to do with children's health. As with all anti-smoking policies, it was about harassing smokers in a futile attempt to make them quit. While it might feel like you can wind up your windows and seal yourself into the safety of your car, that is far from the case. Cars have a constant through-flow of air even with all the windows shut. Air enters through a large duct at the front and is forced through the car. Finally! An explanation for why people don't suffocate to death after driving for half an hour! Thanks for setting the record straight, Sir David. We little people could never have worked that out for ourselves. The best thing for all our health is to leave our cars behind. That's not going to happen though, is it? Why can't environmentalists make some effort to meet the public halfway? It’s been shown that the health benefits of walking and cycling far outweigh the costs of breathing in pollution. If a bit of exercise offsets the perils of air pollution, perhaps the perils are not so great after all? By bringing in a targeted diesel scrappage scheme they could help many more people make greener and healthier choices. Sir David fails to mention his own role in getting people to shift from petrol to diesel in the first place. He has recently claimed to have been misled by Big Diesel but a whole generation were told that diesel was preferable to petrol because it emits less carbon dioxide. King's article is headlined 'Smoking in cars is banned. But children still inhale toxic fumes in backseats'. Those of us who opposed the smoking ban in cars made several of the points King is making now, eg. that cigarette smoke is an utterly trivial source of air pollution when you are on a road. Simple solution. Ban children from cars. CIGARETTE retailers have seen a dip in sales since laws enforcing plain packaging were introduced, according to a recent report. The new laws were introduced barely two weeks ago. It seems unlikely that research could be carried out, reviewed and published in such a short space of time. I can find no trace of this alleged report online, nor can I find any reference to it. And two-thirds of independent retailers were left with stock they could no longer legally sell, according to a report in trade magazine The Grocer. The Grocer article is here. It's paywalled but is referenced in this article. It does indeed say that retailers have been left with unsold stock of products that are now illegal to sell. Hardly surprising. It doesn't say anything about plain packaging causing a drop in sales. Nearly every claim in The Scotsman article that can be verified is untrue, so I rather suspect that the claim about sales is also untrue. The ban, which also outlawed menthol cigarettes and smaller (30g) bags of rolling tobacco, saw the cheapest packet of cigarettes costing £8.82, according to research by consultants Him. The 'ban' - ie. the Tobacco Products Directive - does not ban menthol cigarettes until 2020. It doesn't ban 30 gram bags of rolling tobacco - and 30 gram bags are not small by any reasonable definition. 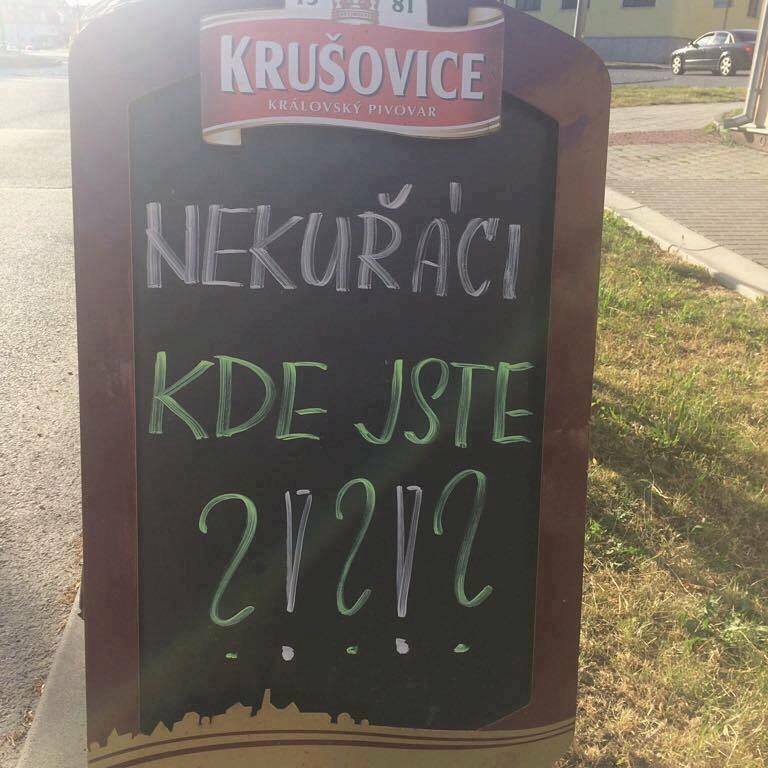 And you can easily buy a pack of cigarettes for less than £7. Four errors in one sentence is pretty impressive. Until I see some evidence to the contrary, I'm going to assume the headline is also wrong. I have used this image before to illustrate the relationship between 'public health' advocacy and science and medicine. In short, 'public health' as we know it today has nothing to do with either science (the search for truth) or medicine (curing disease). It is a political movement with fixed prior beliefs. It has some of the accoutrements of science and medicine - its own journals, its own PhDs and its own systematic reviews - but, as Eric Crampton says, is it not science. It is 'sciency'. In truth, it is a grotesque parody of science. Grotesque because it seeks to do the opposite of science by confirming dogma and narrowing thought. This is not how it works in 'public health'. In 'public health', the activist-researchers 'know' the truth before they turn on their lap top. They 'know' what the problems are (availability, advertising and affordability) and they know the solutions (bans and taxes). 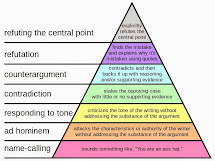 There is ample evidence that these beliefs are wrong-headed or, at the least, overly simplistic, but this evidence is never published in journals that are sympathetic to the cause. One clue that 'public health' is not scientific is that their hypotheses are always proven correct (for example, take this risible attempt to claim that policy-based computer models pass the Bradford Hill criteria for causality). Its policies always work. This suggests a degree of infallibility that is beyond the reach of mere mortals. Insofar as hypotheses are altered by 'public health' research, it is only by purporting to show that the problems are even worse than was previously believed and the solutions are even more effective than was previously believed. It is no coincidence that this is what the media and politicians want to hear. It is not science. It is PR. When Hastings talks about consumption, he does not mean the consumption of specific brands, but of the overall category. So, for example, he thinks that an increase in Heineken advertising leads to an increase in per capita alcohol consumption. Acres of economic evidence based on real world data suggest that he is wrong about this, but he 'knows' he is right. He has known it all his career. To him, it is the 'bleeding obvious' and he has spent 30 years trying to prove it to everybody else. In truth, the only thing that is bleeding obvious is that real scientists do not proceed on the basis that their hypothesis is self-evidently true and then spend years looking for evidence to confirm it. Hastings is not a real scientist. 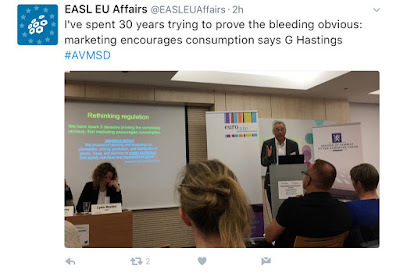 He is a professor of social marketing, whatever that means, but that does not stop him being commissioned by the WHO to give his jaundiced view of the evidence and being treated as if he were an expert by parliamentarians. And while his statement today - assuming it has been correctly reported - was a little too candid for a public event, there are plenty of others on the 'public health' gravy train who will say the same in private. As you can see from the photo below, Hastings sees his next task to be 'proving' that banning alcohol advertising works. You almost have to admire the shamelessness of the man. I have previously argued that Theresa May is relatively sound on nanny state issues. She is reputed to have been one of the cabinet ministers who dissuaded David Cameron from introducing minimum pricing. She voted against the ban on smoking in cars and there is evidence that she watered down Cameron’s hideously paternalistic obesity strategy. We will have to wait and see if my hunch is correct because there is previous little to go in the manifesto. Aside from a vague pledge to ‘continue to take action to reduce childhood obesity’, lifestyle regulation doesn't get a look-in. Nothing on alcohol, nothing on smoking and nothing on gambling. In the spirit of misplaced optimism, I was going to assume that no news is good news and award three stars, but then I remembered plain packaging, the sugar tax and the outrageous food reformulation scam and downgraded it to two. After publishing a loony’s charter of a manifesto in 2015, the Greens are keeping their cards close to their chest this year. It is reasonable to assume that they still want to ban horse-racing, foie gras and rabbit hutches. They probably still want to squeeze an extra £5 billion out of drinkers and smokers. But they do not explicitly say so. Nor do they explicitly say they want to legalise marijuana. Since they are maintaining a dignified silence over their policies, I will have to judge them on their previous manifesto and award two stars. Without the cannabis legalisation, it would be one. Jeremy Corbyn might want to resurrect Old Labour but his first Five Year Plan doesn’t involve rolling back taxes on booze and fags to the levels of the 1970s. The great helmsman describes himself as ‘totally anti-sugar’ despite his hobby of jam-making and his manifesto promises ‘a new childhood obesity strategy within the first 100 days, with proposals on advertising and food labelling.’ In practice, this means a ban on so-called ‘junk food’ advertising on primetime television in a futile attempt to put people off eating tasty meals. The manifesto also pledges to ‘implement the Soft Drinks Industry Levy, commonly known as the ‘sugar tax’’, but the legislation for that has already passed through the Commons and is taken as read. Labour has nothing to say about alcohol, tobacco or e-cigarettes, but it says it will ‘reduce the maximum stake on Fixed Odds Betting Terminals from £100 to £2.’ It will also ‘increase the delay between spins’ which is currently 20 seconds. This would make them completely unplayable. To all intents and purposes, it would be a ban and it would almost certainly lead to the closure of hundreds of bookmakers around the UK. Like Labour, they want to restrict food advertising before the 9pm watershed, but they are also keen on ‘closing loopholes in the sugary drinks tax’. It is unclear whether this means they want to tax other soft drinks or if they want to extend to tax to food products. Either way, it won’t be good for our wallets. Farron’s freedom fighters want to introduce minimum pricing for alcohol and ‘encourage the traffic light labelling for food products’. Ironically, the UK is prevented from doing either of these at the moment thanks to the Lib Dems’ beloved EU. They also want to make the sugar reduction targets legally binding, reduce stakes on fixed odds betting terminals to £2, and introduce a levy on tobacco company profits ‘so they fairly contribute to the costs of health care'. It will be interesting to see how they intend to do the latter, as most tobacco companies are not headquartered in the UK and therefore cannot be subject to a windfall tax. Whatever tax they come up with will no doubt be passed on to consumers one way or another, thereby adding to the £11 billion tax already paid by smokers each year, a sum that covers the 'costs of health care' associated with smoking several times over. Once again, the Lib Dems have put together another monstrosity of a manifesto to make John Stuart Mill turn in his grave. On the other hand, they want to legalise marijuana - albeit in the most useless and miserable way. I would normally give an extra star for cannabis legalisation but the rest of the manifesto is so horribly paternalistic that I cannot bring myself to give them more than one. The only tiny glimmer of hope comes when they say that they 'will continue to advocate a review of alcohol taxation to better reflect alcohol content’. I have previously argued that alcohol should be taxed by the unit, rather than the current system which privileges cider drinkers at the expense of those who prefer spirits. The SNP appears to want to move in this direction because ‘the Scotch Whisky industry is a key sector of Scotland’s economy’. Given this hint that they might want to reduce duty on spirits, I will give them two stars rather than the one star that they almost certainly deserve. Under Nigel Farage, UKIP could be relied on to take a relaxed approach to booze and tabs, but those days are over. The Kippers' longstanding pledge to amend the smoking ban is notably absent from the 2017 manifesto. Rather than repeal the worst thing Labour ever did, they are going to repeal the best. They want to get rid of the 2003 Licensing Act which was supposed to create 24 hour drinking but never did. UKIP cite some worthless research from the UK Temperance Alliance - or the 'Institute of Alcohol Studies' as it now calls itself - to justify closing the boozers at 11pm. It will, they reckon, ‘protect emergency workers from abuse’. They also want to ‘bring in new legislation to reduce the density of alcohol outlets and restrict trading times’. Back to the Fifties with Nutall! As if that weren’t enough - and it really is - UKIP are the third party promising to reduce the stakes on gambling machines in bookmakers which, as mentioned above, amounts to a de facto ban on fixed odds betting terminals. They will also ‘keep and enforce current legislation on the use of illegal drugs’. So much for the purple libertarians. All of these scores are probably too generous. Politicians know that nanny state legislation is not popular with the public and are therefore reluctant to show their full hand in their manifestos. Labour brought in a draconian smoking ban in 2007 despite its 2015 manifesto explicitly exempting drinking establishments that did not serve food. David Cameron did not mention plain packaging in his 2010 manifesto and the sugar tax did not feature in his 2015 manifesto. The only major nanny state policy to feature in a ruling party’s manifesto in the last decade is minimum pricing for alcohol - and that never happened.